A new technology has taken the housekeeping industry literally by storm this past year. It is activated water. The recent threat of an H1N1 pandemic severely impacting our public health prompted new and innovative ways for spot cleaning, particularly to clean frequently touched surfaces (frequently referred to as “high-touch” or “common-touch”) in institutions in which the flu finds an ideal fomital transmission environment, such as schools, hospitality, recreational and correctional facilities. Because several states, as well as the U.S. Federal Government, are aggressively urging the housekeeping industry to embrace the concept of sustainability and green cleaning, coupled with the U.S. Environmental Protection Agency (EPA)’s Tools for Schools initiative, the housekeeping professionals have responded by seeking better ways of cleaning with products of lower toxicity and zero persistence in the environment. Not surprisingly, nothing meets this criterion better than water. As sanitarians in the public health arena, we are not only concerned with cleaning but also significantly reducing the bioburden as we clean. Additionally, by way of disease prevention, maintaining the potential bioloads of these surfaces as low as possible, under practical and cost-effective conditions, makes the use of water, in any form, ideal. However, before I go on to explain the phenomenon of activated water products and their potential use in the retail food industry, let me first take this opportunity to clarify the terminology we use in its description and to place activated water in the proper context of cleaning and bioload reduction. Activated water closely fits the criteria of cleaner and “sanitizer” versus that of a “disinfectant.” To make this distinction, I found an excellent short lexicographic essay with a bit of history attached to it. It was written by someone at Hillyard Chemical who deserves my thanks and admiration. I am taking the liberty of paraphrasing this marvelous piece for brevity of explanation. The difference between a “disinfectant” and a “sanitizer” is one of specific application. Whereas the health care industry is mainly interested in “disinfectant” data, the food service related industries guided by the Public Health Services are primarily concerned with “sanitizer” claims. The actual difference between the two terms is, to some extent, a matter of legal definition. In current American regulatory parlance, a disinfectant is a product that completely destroys all specific test organisms in 10 minutes under conditions of the AOAC Use Dilution Test, whereas a sanitizer is a product which destroys 99.999% (or a five-log reduction) of specified test bacteria in 30 seconds under conditions of the Official Detergent Sanitizer Test (sometimes called Weber & Black Test). Obviously, the two tests deal with different aspects of the same problem: killing bacteria. Interest in the use of germicides used in hospitals centered on completely destroying all possible microorganisms. In the normal course of hospital application, it was felt practical to allow at least 10 minutes of contact time to accomplish this objective. As a result, most disinfectant tests were developed to ascertain whether any bacteria survived 10 minutes of germicide contact—nothing more, nothing less. As a matter of fact, when contact times significantly less than 10 minutes are allowed, it becomes very difficult to get any kind of meaningful results out of the Use Dilution Test. In foodservice and other public health-related industries, interest in germicides took a different approach. It became obvious that the conditions of use differed from hospitals and that tests based on 10-minutes contact time could not be satisfactorily interpreted. Public health professionals reasoned that, in many cases, 30 seconds was about all the contact time they could realistically expect. Nevertheless, the prevailing disinfectant tests could not yield 30-second results. Therefore, they developed their own test—which is now the Official Detergent Sanitizer Test. Because the public health scientists did not anticipate that they could actually get complete kill in 30 seconds with any practical chemical agent, they developed a test in which bacteria are actually counted (as opposed to the Use Dilution Test, which indicates presence of bacteria but yields no counts). They found that a 99.999% reduction in 30 seconds with practical agents was quite acceptable, if not perfect for the intended application and adopted this standard. To distinguish these products from disinfectants, they called them sanitizers. 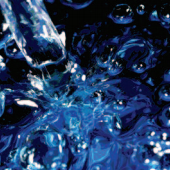 There is considerable confusion about how the current generations of activated water cleaning products work (both hand-held sprayers and auto-scrubbers). First, they all start with plain potable tap water. The water must be conductive. While most conventional products clean and sanitize based on chemistry or chemical reactions, the newer solid-state activated water sprayers and scrubbers work mainly on principles of physics and electrical engineering. Contrary to popular perception, the process is not solely or mainly based on typical electrolysis. The technology does however use electrolysis, causing almost imperceptible pH and other changes in water chemistry, but these barely measurable effects are not the “active ingredient” used to clean. Applying a small amount of electricity to water breaks down the water’s molecules, lowering water’s natural surface tension and creating positively and negatively charged water ions. In some applications, it can also add microscopic oxygen gas bubbles that carry an electrical charge. When applied to a surface in this electrolyzed form, water can spread to contact dirt, just as it does when mixed with chemicals. The charged ions in the water attach to the dirt and help lift it from the surface. In addition, water electrolysis is actually applied to “create”—for want of a better word—charged nano-sized gas bubbles or “nanobubbles” in water. These electrically charged bubbles attach themselves to dirt particles, causing the particles in turn to become charged and repel from surfaces, thus, enabling soils to be suspended in water and wiped away. Soil removal performance tests were developed and conducted by the University of Massachusetts’ TURI Lab. Most testing was performed to a modified ASTM G122 Test Method, a modified version of the Green Seal GS37 standard, the CSPA DCC 17 - Greasy Soil Test Method or the CRI Carpet Spot Cleaning TM 110 standard. The test results clearly show that activated water cleaning works effectively on most common soils including those found in food production. As a sanitizing agent, the main “ingredient” behind the germ-killing effect of modern activated water devices is electroporation. This is a scientific process that applies a low-level electrical field to bacteria or viruses. This electric charge creates holes or “pores” in the membrane of the cell, known as “electroporating” the cell wall, breaking down the walls of bacterial cells and killing them. It is also believed that pathogenic viruses are affected in the same way. Only when the unit is activated in which the water acts as a conductor does the electroporating activity occur. With the newer hand-held devices, this entails spraying the surface constantly for six seconds to sanitize it. EPA-compliant Good Laboratory Protocol tests show that it works and is an effective broad-spectrum sanitizer. One of the benefits of the electroporation technology is that it does not require contact or dwell-time for efficacy. Contact with the spray itself was shown to cause an immediate three-log reduction without any additional help from flushing or mechanical soil removal. Furthermore, the electrically activated water is completely safe and returns to its natural state in about 30 to 45 seconds. Studies show that electrically activated water cleans as well as, or better than, traditional general-purpose cleaning chemicals. There is yet another cleaning method “Activated water closely fits the criteria of cleaner and ‘sanitizer’ versus that of a ‘disinfectant.’” that predates activated water but uses tap water and table salt. It is commonly dubbed electrolyzed water where ions are basically scrambled by an electric current. Unlike activated water, it relies on a contact time for its efficacy as a cleaner and sanitizing agent. The generators use a combination of cell technology, salt and electricity to alter the molecular structure of water, creating a non-toxic oxidized antimicrobial solution that is capable of killing many pathogens in less than a minute. Opposed to smaller, hand-held devices with activated water, this is an in-situ technology that has been used as an effective cleaner and broad-spectrum sanitizer for decades in Russia and Japan, and is finally winning acceptance here in the U.S. and Canada. The sanitizing characteristics are a bit different in this technology. The high oxidation of the water first damages bacteria cell walls, allowing infiltration by water. The microbe reaches capacity, causing an osmotic, or hydration, overload. The acidic fluid and water floods the cell more rapidly than the cell can expel it, literally causing the cell to burst. Although the initial cost for the water electrolysis unit is somewhat high, in most instances, it can be amortized in 1 year by effectively replacing conventional cleaners in mop buckets, sprayers and anywhere harsher and more toxic cleaning chemicals are currently used or needed. In addition, it has no odor, nor does it produce foam, making it ideal for use in food production. There are numerous citations in the scientific and industry literature that this technology has effectively demonstrated excellent cleaning ability in the dairy, poultry and produce industries. Test results showed that for a dwell time between 7.5 to 10 minutes, the electrolyzed oxidizing water was as effective in removing organic matter as conventional treatments, making this technology ideal for general use in retail food establishments. These technologies show great promise, limited only by our imagination. I predict that full approval and acceptance of for both the activated water and electrolyzed water for use as both cleaners and sanitizers in the retail food industry is already becoming a reality. On a personal note, activated water hand-held generators have been used in my home for general cleaning for over a year. I have used both ATP swabs and RODAC plates in various small experiments in which comparisons were made between activated water and brand-name household chemicals purchased from my local super market. I found virtually no difference between the two. Because the activated water generator is always available and requires a mere press of the trigger, it is used considerably more often than the conventional cleaners. Being a bit lazy, the idea that there is no additional bucket, dilution or mixing involved makes this technology particularly appealing. While it does not entirely replace all cleaning products, it has had a profound effect in reducing chemical use in my home (a good thing because I have a septic system) and has markedly improved overall cleanliness, particularly in the bathrooms. If it works well for me, it certainly can work well in our industry. Going green has never been easier, and the more we know about these technologies, the greater the potential for overall food safety. As regulators, we need to embrace these technologies as soon as possible— regulations permitting. Forensic sanitarian Robert W. Powitz, Ph.D., MPH, RS, CFSP, is principal consultant and technical director of Old Saybrook, CT-based R.W. Powitz & Associates, a professional corporation of forensic sanitarians who specialize in environmental and public health litigation support services to law firms, insurance companies, governmental agencies and industry. For more than 12 years, he was the director of environmental health and safety for Wayne State University in Detroit, MI, where he continues to hold the academic rank of adjunct professor in the College of Engineering. He also served as director of biological safety and environment for the U.S. Department of Agriculture at the Plum Island Animal Disease Center at Greenport, NY. Among his honors, Powitz has received the NSF/NEHA Walter F. Snyder Award for achievement in attaining environmental quality, and the AAS Davis Calvin Wagner Award for excellence as a sanitarian and advancing public health practice. He is the first to hold the title of Diplomate Laureate in the American Academy of Sanitarians, and is a Diplomate in the American Academy of Certified Consultants and Experts and with the American Board of Forensic Engineering and Technology. Dr. Powitz welcomes reader questions and queries for discussion in upcoming columns. Feedback or suggestions for topics you would like to see covered can be sent to him directly at Powitz@sanitarian. com or through his Web site at www.sanitarian.com.